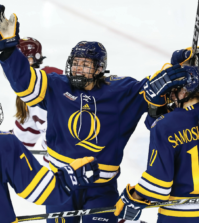 Flashback three years ago, when the Quinnipiac women’s hockey program was coming off a three-win season, and look at today’s team and notice the metamorphosis that has taken place. In 2008-09, Quinnipiac capped another season sitting in the cellar of ECAC hockey. For the second straight season they won just two conference games and were deemed perennial losers by everyone in the league. Fast forward to the 2011-12 season and the Bobcats have certainly come a long way. Quinnipiac shocked everyone in the ECAC in 2009-10 as they broke numerous records on their way to a 11-3-7 conference record and their first ECAC playoff appearance in program history. Despite falling in the first round, news of the deciding third game in the series reached national television as they fell to RPI, 2-1 in five overtimes. 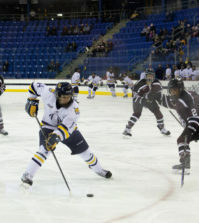 The Bobcats proved the 2009-10 season wasn’t a fluke as they finished 12-9-1 in the ECAC and advanced to the ECAC semifinals for the first time in history. Quinnipiac head coach Rick Seeley cities his team’s preparation as the biggest factor for success. “We know what’s made us successful in the past and it’s just working hard and taking each opponent with respect and playing the same way regardless of who we’re playing,” Seeley said. 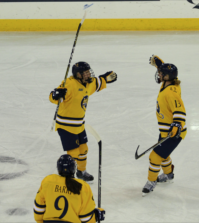 For the 2011-12 season, Quinnipiac returns its top eight scorers from last year’s squad, including returning ECAC Rookie and Player of the Year Kelly Babstock. She broke the program-record for most goals (30), assists (28), and points (58) in a season as well as breaking the single-game point record when she recorded six in a game against Sacred Heart. The challenge for Seeley and his coaching staff will be opening up opportunities for Babstock who won’t be surprising any opponents this season. Joining Babstock at the forward position are senior Kate Wheeler and sophomore Erica Uden Johansson. Although Uden Johansson is out recovering from surgery, both are the only returning skaters to have recorded at least 25 points and finish with double-digit goals and assists. Fellow junior forward Brittany Lyons will look to build off her heroic playoff effort in the first round as she scored the game winner against Princeton with only five seconds remaining in regulation. The Bobcats depth on the back line will be on display early as they are led by seniors Bethany Dymarczyk (six goals, 18 assists) and Jordan Elkins (five goals, eight assists) who is sidelined due to surgery. Filling in for Elkins will be junior Regan Boulton (nine goals, seven assists) as well as sophomore Shelby Wignall and junior Felica Vieweg. Noting the depth and star power coming back this season, perhaps the greatest strength of this Bobcat team is between the pipes. Junior Victoria Vigilanti returns after another stellar season in net as she finished with a 1.68 goals against average and a .932 save percentage, proving her freshman campaign where she led the nation in goals against (1.24) and save percentage (.950) was no fluke. Since joining the team two years ago, Vigilanti has shown remarkable durability in goal, playing in 73 of 74 possible games. Playing in their first season with the Bobcats, freshman forward Nicole Kosta has already made a good first impression with her hard work in the preseason. Quinnipiac also will employ the skill of junior forward Breann Frykas, transfer from the University of Wisconsin. Bobcat seniors Dymarczyk, Elkins, Wheeler, Chelsea Illchuk, and Melissa Perry have been with the program since the beginning of the transformation. They have been through a three-win season and also played into the ECAC semifinals in just three seasons. There is still time for all five to lay more groundwork on what have already been unforgettable careers. Kelly Babstock (So., F)-The reigning ECAC Rookie and Player of the year will look to build upon her record-breaking performance from last season when she broke the program record for goals (30), assists (28), and points (58) in a season. Babstock continues to impress her coaches with her determination to improve, something she will need, being the focal point of every opponent’s defensive scheme this season. Victoria Vigilanti (Jr., G)-The junior goaltender has been a mainstay between the pipes for the Bobcats the last two years. She is coming off of another stellar season in which she led the ECAC in shutouts (9), saves (841), and minutes played (2,179). Vigilanti has also shown durability, playing in 73 of 74 games over the last two seasons.